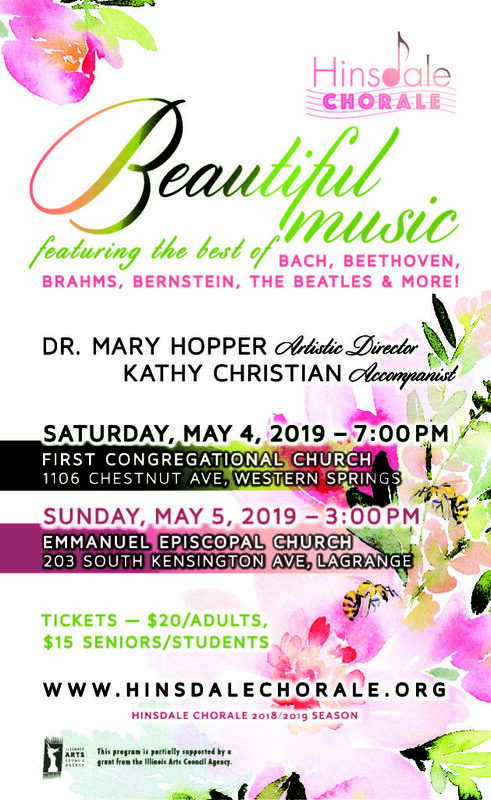 Hinsdale, Ill. – March 19, 2019 – Hinsdale Chorale announced today that its Spring 2019 concert, “Beautiful Music”, will be held Saturday, May 4, at 7:00 p.m., at First Congregational Church of Western Springs (1106 Chestnut), and Sunday, May 5, at 3:00 p.m., at Emmanuel Episcopal Church in LaGrange (203 S. Kensington). Under the direction of Artistic Director Dr. Mary Hopper, and accompanied by Kathy Christian, the performance will feature music by composers whose names all begin with the second letter of the alphabet. The famous “three B’s” of Bach, Beethoven, and Brahms will be represented. 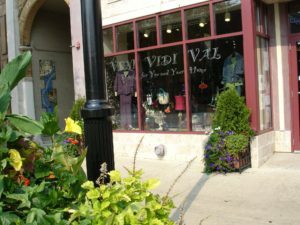 Bach will be honored with a rendition of “Jesu, Joy of Man’s Desiring” and the Chorale will perform the first movement (Kyrie) of Beethoven’s Mass in C Major, as well as 11 selections from Brahms’ “Liebeslieder Waltzes.” Also featured will be a madrigal by Elizabethan composer John Bennett; “Sure on this Shining Night” by American composer Samuel Barber; and three arrangements of songs by Leonard Bernstein. The group will top off the performance with five arrangements of iconic Beatles songs. 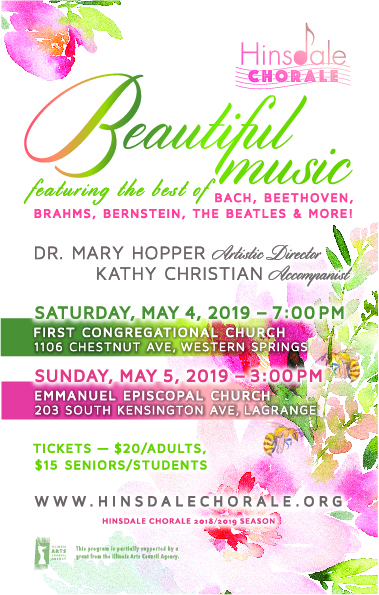 Tickets for “Beautiful Music” are $20 for adults / $15 for students and seniors. Buy tickets here or call 312-510-1823. Our first installment features our beloved accompanist, Kathy Christian – enjoy! 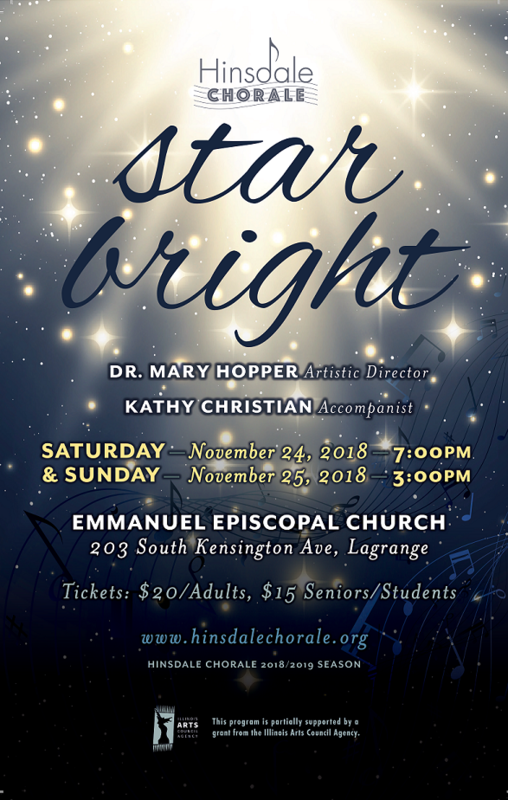 Hinsdale Chorale is a non-profit and educational organization comprised of dedicated professional and amateur singers led by a professional director. 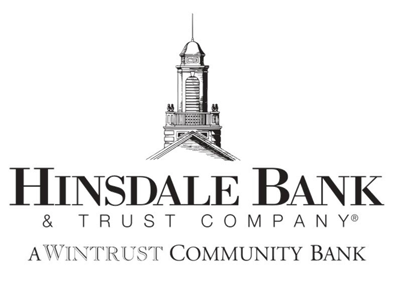 The group performs formally twice each year as well as several special appearances for the Hinsdale community. 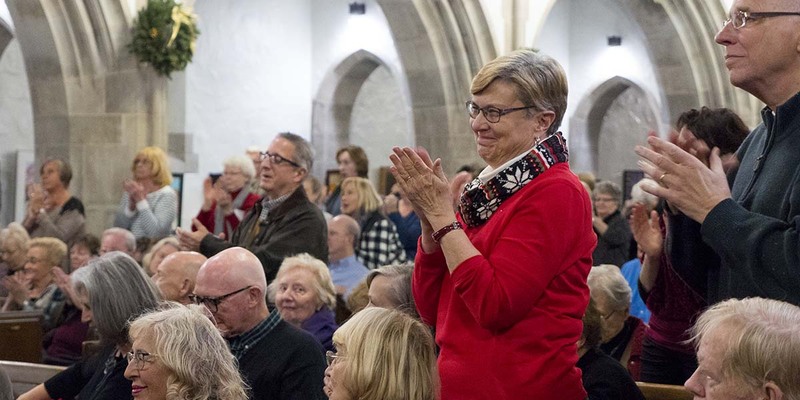 The Holiday show has traditionally been the most extensive performance, often highlighted by orchestral accompaniment of solo and choral selections and often including an audience sing-along. The second formal show takes place in the spring and has provided the opportunity for us to extend the range of music selections. 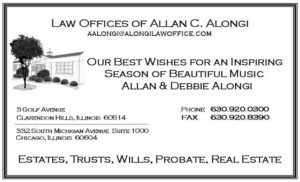 The group also often supports the Memorial Day services at Memorial Hall with patriotic selections and participates in Hinsdale’s annual Christmas Walk featuring holiday favorites. Mark your 2019 calendars for our spring concerts or buy tickets now! Thanks so Much for Attending Our Winter Program!